When Hunx and his Punx came to Chicago with Shannon and the Clams in April, they wanted late night pizza after their Empty Bottle show. In true White Mystery snack fashion, we brought them to Chicago Ave. for 24 hour slice options. Upon entry, Village Pizza flicked their lights on-and-off to create a disco effect for the gaggle of make-up smeared punks. 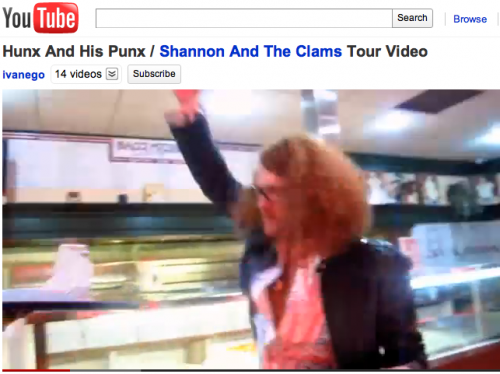 Francis Scott Key White enjoying the pizza dance party made the cut for the Hunx and his Punx tour video here! I cannot begin to imagine the kind of things that that owner would have said about Hunx. They flicked their lights on and off to create a strobe effect, and we danced with slices of pizza in our hands.